Woodworking Canada Publisher and AWMAC Ontario board member Bert Kleiser, left, presented the winners trophy. Ken Smith, Josh Pilot, Rob Nogas and Desmond Lee were members of Hardwood’s winning team. 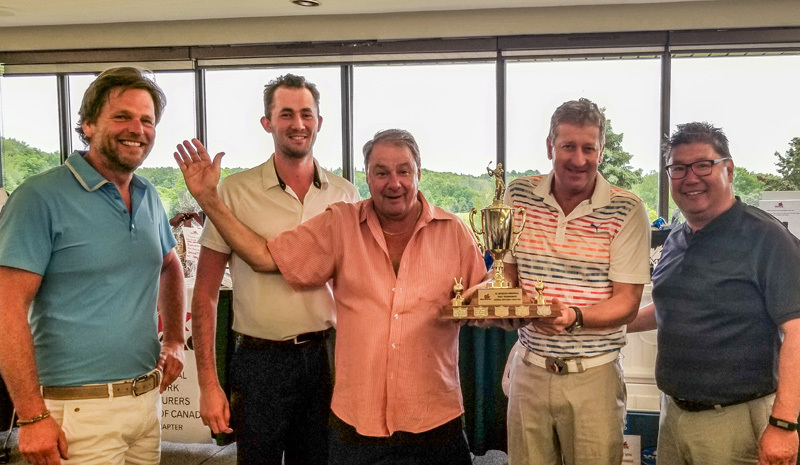 AWMAC Ontario held the annual Al Sparling Memorial Golf Tournament on Friday, June 22 with more than 130 participants, making it one of the best ever. a student at Georgian College — which hosted the Apprenticeship Contest this year. Registrations and breakfast started at 8 a.m. and there was a shotgun start at 10 a.m. The tournament was followed by a cocktail reception at 3:30 p.m. and dinner at 5 p.m. with 150 people in attendance. Organizer thanked participants and sponsors for their support, which made it possible to once again make a positive difference in the life of woodworking students. Ken Smith, Josh Pilo, Rob Nogas and Desmond Lee were members of Hardwood’s winning team.